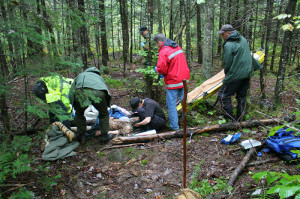 SAVED: Not long ago, the Maine Warden Service found an elderly man who had been missing in the woods for two long, cold, rainy nights. To our astonishment and delight, he was alive. In the photograph, which appeared in the Portland Press Herald, I am shown kneeling as if in prayer. I suppose it was prayer of a kind: I had his head on my lap, wrapped in my fleece vest to keep it out of the mud and warm, and I was talking to him so he wouldn’t be frightened by the attentions of these, his rescuers. The sweet chariot du jour was an Warden Service all-terrain vehicle, capable of securely transporting a high-impact plastic stretcher, and the angels were a bunch of wet, muddy game wardens, state troopers, fire and rescue personnel, volunteer searchers and K-9 units, especially a handler (and former game warden) Deb Palman and her German Shepherd Quinn. According to Devon Platte, the co-executive producer of the reality show that focuses on Maine game wardens, the plan calls for Animal Planet to debut Season 2 of NORTH WOODS LAW on Oct. 3. Haven’t heard of North Woods Law? It’s apparently a BIG hit—one of the cable network’s most successful shows. The Maine Warden Service Chaplain has not appeared in any of the previous episodes (though I did have a cameo as what appeared to be a little fat man sitting in a boat) but this time around, the chaplain is going to be on screen. Neither the Maine Warden Service nor any of the wardens who “star” in the show are remunerated (that would be illegal) but the command staff agreed to do the show because they imagined, correctly as it turned out, that the show would educate many about the work and world of Maine game wardens. 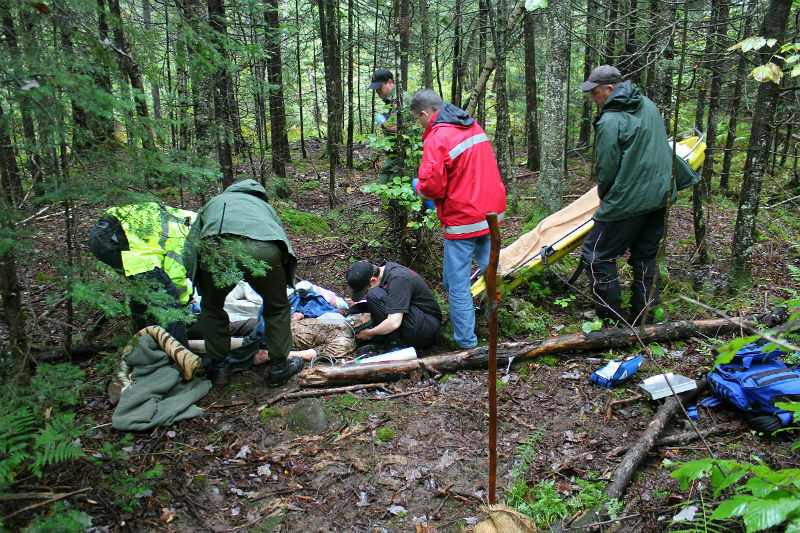 As it turned out, it’s been a great recruiting tool for conservation law enforcement, and some of the practices and innovations of the MWS have spread to other agencies via NORTH WOODS LAW. So it struck us all with belated force that perhaps the MWS Chaplain idea might be spreadable too? In any event, there will be a fairly long segment in the premier episode in which my work in the field features. I’ve seen myself on tv, and it’s not a pretty sight (why do I flail around so much when I talk? Why is my head so large?) but the people I’m with (wardens and the family of an accident victim) are absolutely beautiful. HARVEST TIME: My husband has had real gardens, serious gardens, planted, fertilized, thinned, weeded, attended to, even cosseted, gardens which in their turn were expected to produce food, but my beloved Simon has been struggling to create and maintain a decent vegetable patchin our yard for six years and it’s never quite come off. All around our house lie his beautiful compositions of ferns, mosses and hostas thriving amid lichened rocks. Not least among their many agreeable features is that Simon’s gardens are positioned so as to enable appreciative viewing from the warm and comfortable inside of the house. I can look up from my book and gaze upon them. But the vegetable garden just won’t take. Vegetables need sun, and the only sunny (-ish) patch of our essentially shady yard is in an area that doesn’t have good soil. So an awful lot of compost, manure and fuss has to go into the ground before it grudgingly yields even a few tomatoes. Simon has so much else to fertilize and fuss over ( friends, children, porcelain clay, students and studio apprentices, galleries and collectors not to mention his wife’s writing projects, game wardens and mental health) that the vegetable patch, having been planted in the enthusiasm of spring, always gets less and less attention as the summer goes on. The mingy, unprepossessing zucchinis we usually forgot to harvest in August just made us feel guilty. Simon felt guilty for neglecting the garden. I felt guilty for not helping, and then we resented one another for making demands and/or shirking responsibility. Our vegetable patch was affecting our relationship. What could we do? All authentic Mainers grow vegetables. It’s how we earn the right to live here. Growing vegetables is the minimum sine qua non: To really deserve to live in Maine, you pretty much have to boil sap, pickle fiddleheads and hunt deer, too. “I love working in the garden,” said Simon. “But we can’t just leave the patch empty, after we put all that effort into building up the soil,” said Simon. Okay, it wasn’t much of a plan. On the other hand, it was about as much plan as (realistically, remember) I was likely to follow. So one day in late May, my daughter Woolie joined me at the tool shed, where I was tossing trowels and rakes into the wheelbarrow. Told to dress for a lesson in soil and toil, Woolie had chosen leopard-patterned shorts, an old, felted, moth-eaten black sweater and a fedora. Her long, pale legs ended in striped plastic boots and she wore sunglasses with baby-blue rims. “Perfect,” I said, handing her a pair of orange work gloves. Together, we loaded the contents of the composter into the wheelbarrow and wheeled it over to the sunny-ish patch. We did a little half-hearted digging and raking, smashing up some of the more recognizably not-quite-composted items and covering the rest with lumps of dirt. Then I reached into my back pocket and produced five packages of seeds: Zinnias, nasturtiums, assorted sunflowers, pink, purple and orange cosmos. Tearing one open, I poured the little, fat nasturtium seeds into the palm of my hand and flung them gaily over the ground. “Aren’t you supposed to plant them in, like, rows?” asked Woolie dubiously. My daughter shot me a scornful glance over the top of her blue-rimmed sunglasses. How sharper than a serpent’s tooth is the child who no longer believes (or at least pretends to) in her parent’s fibs and delusions? “Fine. Actually, it’s because I am lazy and inattentive…” I admitted. “But that doesn’t mean there aren’t spiritual lessons to be learned here. Without investing ego, without attempting to control things, without attaching ourselves to an outcome, we are releasing the seeds, letting them fall and grow as they will.” I tossed forth the zinnias and sunflowers. A bit more raking, a long soak from the sprinkler, and we were done. We went into the kitchen where Simon was cooking supper. As if our appetites had been whetted by a hard day’s honest toil, we made a big to-do out of complimenting the aroma of the roasting chicken as we took off our muddy boots in the mudroom and washed the soil from our hands. That was pretty much it, as far as gardening went this summer. Oh, every now and then Woolie or I might wander out to the sunny patch and thin the leggy green seedlings. There were all sorts of volunteer tomato, squash and pumpkin sprouts, gifts of the compost, which we mostly plucked out, but a few remained. Mostly, though, we got on with the rest of life. I performed three weddings and a funeral. I did some writing and cleaned the bathroom. I turned fifty-one, and went out to supper with my husband and friends. I accompanied the warden service dive team as they searched for, and found, the body of a Vietnam veteran who’d fallen out of his fishing boat. I went to the Lincolnville strawberry festival where I got to play with a toddler. The plants extended larger, greener leaves and captured light. They grew taller. I visited my daughter Ellie in the hospital, and rejoiced when she was well enough to go home. I swam in a lake. I attended the Law Enforcement Academy graduation, the dedication of a memorial to the victims of a snowmobile accident and the funeral of a New Hampshire game warden. At all of these events, I was given small babies to hold. The plants formed buds. The buds swelled. I ran into a few old friends I hadn’t seen for years: They haven’t changed a bit, but their babies are now adults, towering above our heads. I climbed a few mountains. I crocheted my first granny-square, and then my first granny-square afghan. I preached a few sermons. I swam. I forgave my mother for everything. And now the sunny-ish patch has burst forth with flowers, each a flabbergasting miracle of hue and symmetry. Great crimson, viridian and saffron zinnias, white and violet cosmos, deep orange nasturtiums, yellow sunflowers are blooming. How did this happen? A real gardener could doubtless see what isn’t there, the plants that might have been, the better blooms they would’ve borne…To any real gardener, the patch is a tangle of vines and stalks that speaks or shrieks of all I should have done and failed to do. Having given up on being a real gardener, I’m happily picking more bouquets for my darling Simon (and ironically, plucking more tomatoes) from this patch of dirt and garbage than I ever expected. Certainly, I am getting far more from it than I earned, or could deserve. “I think she’s harvesting spiritual metaphors again,” Woolie says dryly to Simon. This entry was posted on Saturday, September 28th, 2013 at 7:44 pm and is filed under Uncategorized. You can follow any responses to this entry through the RSS 2.0 feed. You can leave a response, or trackback from your own site.